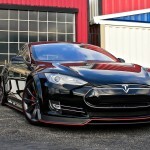 At first glance, this might look like a Tesla Model S plucked straight from the GT Masters at Nürburgring. It even kind of drives like one. 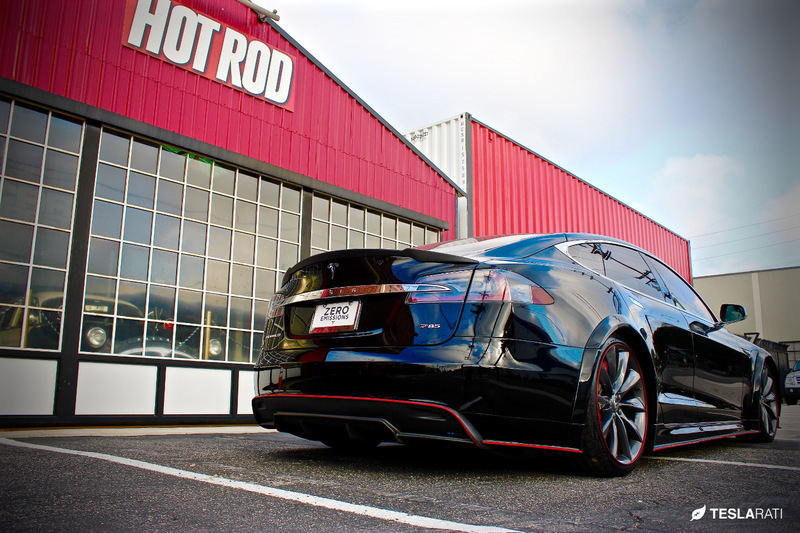 But the truth of the matter is, it’s a factory Model S – with a steroid addiction. 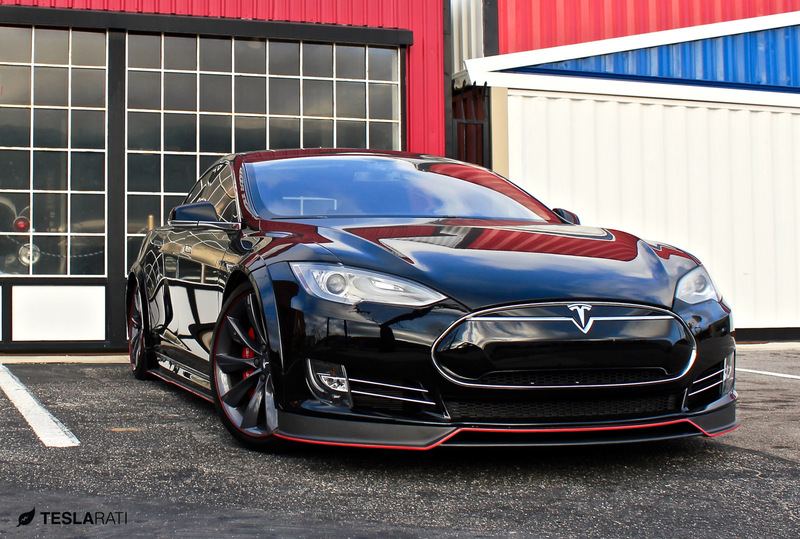 The R-Zentric Model S is one of the most race-inspired looking Teslas on the road today. One look and it’s evident this Model S has an innate ability to radiate Ludicrous performance without actually having to move a single electron. The seamless blend of the carbon fiber front splitter with factory bumper, along with its innocuous-looking side skirts that flow harmoniously into the factory contours, had me reduced to a whining child wanting my Christmas present five months in advance. Maybe it was my inner “Gran Turismo” resurfacing in adult life (I played a heck of a lot of that game as a kid), which manifested itself into an insatiable desire to have my very own GT Model S. Or, maybe it’s because … well, it just looks damn perfect. So, I had to get it. The Model S is a car that sits in a segment where its rivals are better known for being grocery-getter family sedans than tire shredding super cars. Except this modest looking four-door sedan plays with the best of them, and on many accounts, will hands down destroy any super car in a heads up drag race. One might argue that such super car performance (even more relevant with the latest P90D) deserves to be outfitted with something other than sheep’s clothing. 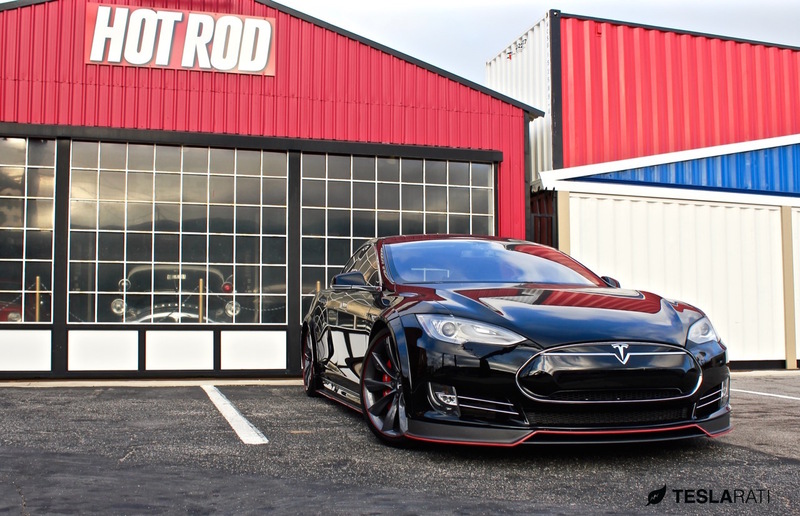 Enter RevoZport, design house and manufacturer of high-end composite products for some of the world’s top exotics; Lamborghini, Ferrari, the mighty Nissan GTR, and now, Tesla with its R-Zentric aero kit. RevoZport offers a variety of bolt-on aero kit components consisting of a front splitter, side skirt, rear diffuser, and a handsome rear spoiler that wraps the full length of the trunk from end-to-end. 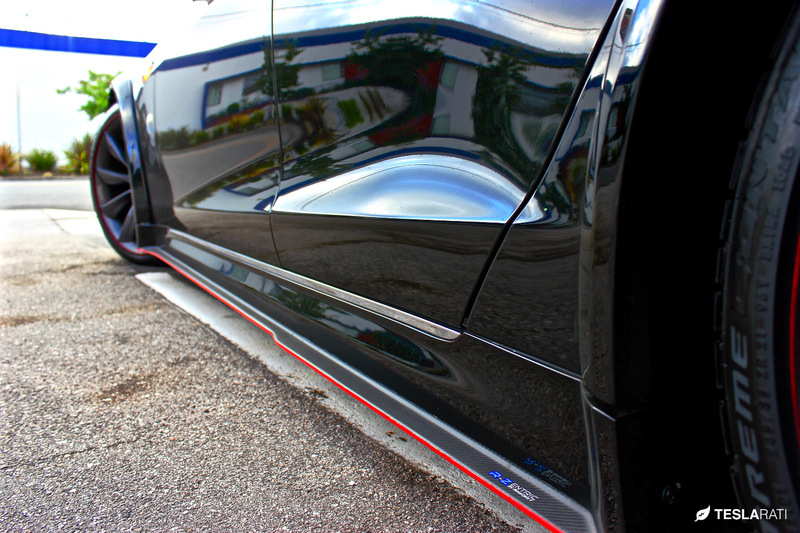 An optional fender kit can be added to provide a slightly wider (approximately 20 mm on each side) and more aggressive GT style appearance. No surprises here, but my affinity towards anything Gran Turismo had me opting for the full aero kit package. 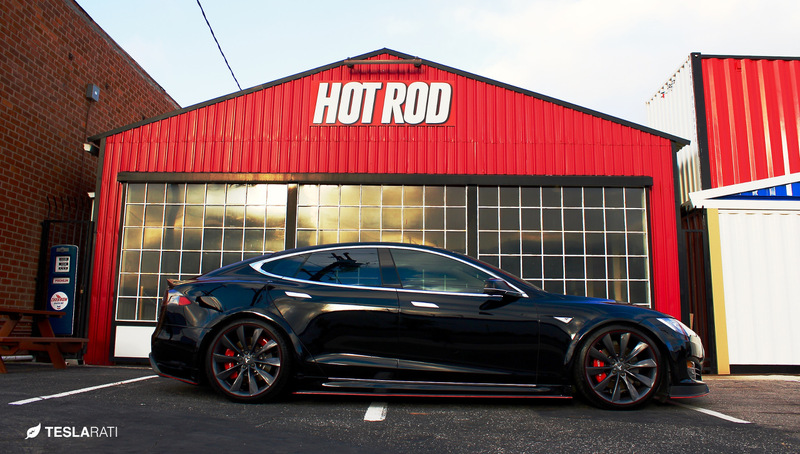 Enlisting the help of Ghost Motorsports out of Los Angeles for installation, body work and suspension tuning, the once modestly styled Model S, transformed into something slightly more character-enhanced. 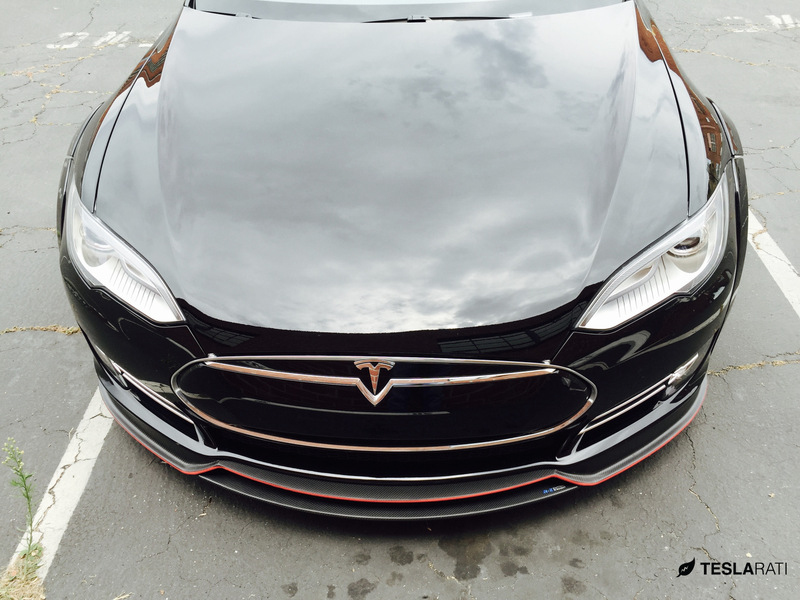 The team at Ghost Motorsports outlined key areas of the carbon fiber composite components with muted red pin-striping to complement Tesla’s factory red stitching found on the performance seats. A set of adjustable air suspension lowering links was added to provide a sleeker look with more controlled handling. The ride height was adjusted to mirror Tesla’s previous “low” setting found in the early days of Firmware 5.0. 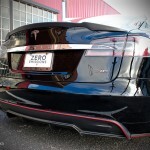 Although the vehicle looks much lower to the ground than a factory Model S, the shape and depth of the aero kit gives the illusion that its lower than it actually is. Tesla’s GPS enabled smart air suspension ensures that any high-ramped entryways or streets lined with large speed bumps are easily surpassed with no signs of scraping. Ride quality remains the same, if not, slightly tighter at higher speeds. 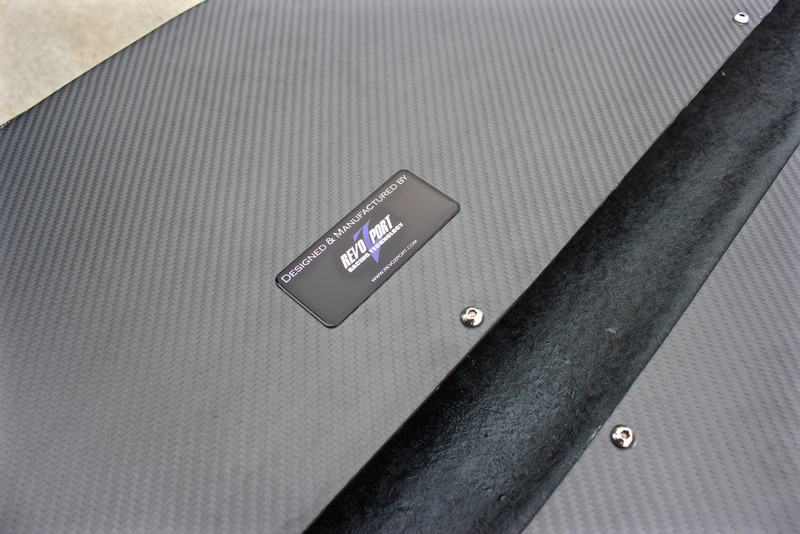 The re-profiled front contour with dual-deck, upper and lower panel, splitter channels air through an adjustable center duct before exiting through the flat underbelly of the car. 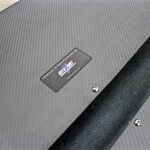 Make no mistake, RevoZport didn’t build this for nightclub valets: it’s all about the engineering and performance. But, let’s be real, short of being a track junky, most Tesla Model S owners will just want the R-Zentric aero kit for its aesthetic appeal. Luckily, that it has. With the increase in aerodynamic downforce also comes range loss, right? Well, the short answer is, yes. But much to my surprise, the increase in energy consumption during my day to day drive, over the last 500 miles, was negligible. Maybe it’s because one never has much of a chance to drive beyond 50 mph in Los Angeles due to traffic, but the fact of the matter is, energy consumption hovered around my 318 Wh/m lifetime average. Occasionally, I’d see consumption come in at 322 Wh/m and as high as 333 Wh/m but it’s hard to gauge whether that increase was a result of a no-traffic-today-in-LA induced excitement or a result of increased drag. Wind resistance would be more prominent at higher speeds. Using a 1,500 mile road trip as the benchmark for a range test, I found an additional increase of 5 – 8% in energy consumption when traveling at a consistent 75 mph. Just for fun, we did a quick and spirited dash to 100 mph on an empty stretch of road while making our way back from TMC Connect 2015. The purpose was to detect for any abnormal sound or change in driving behavior as a result of the aero kit. Nada. Zilch. Just insane fun. The R-Zentric aero kit might be the closest representation of what a GT Model S would look like should Tesla one day enter into the Motorsports arena. 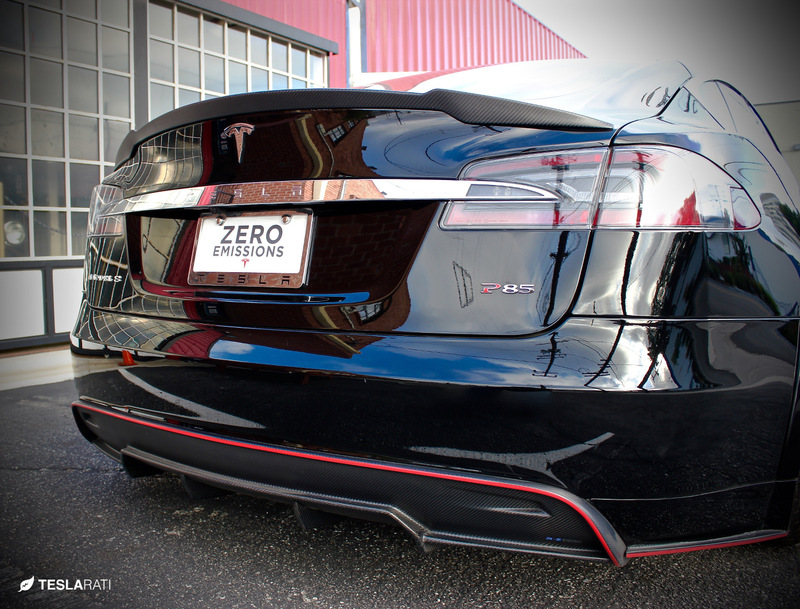 The subtle outward swoop of the side skirt and dual-deck carbon fiber front splitter adds elements of uniqueness, and additional life, to the sleek curves of the Model S.
For discriminating buyers looking for something a little different, especially those Ludicrous P90D and P85D owners looking for an air of exclusivity outside of having a plastic underline, the R-Zentric aero kit just might be your answer. It was for me. 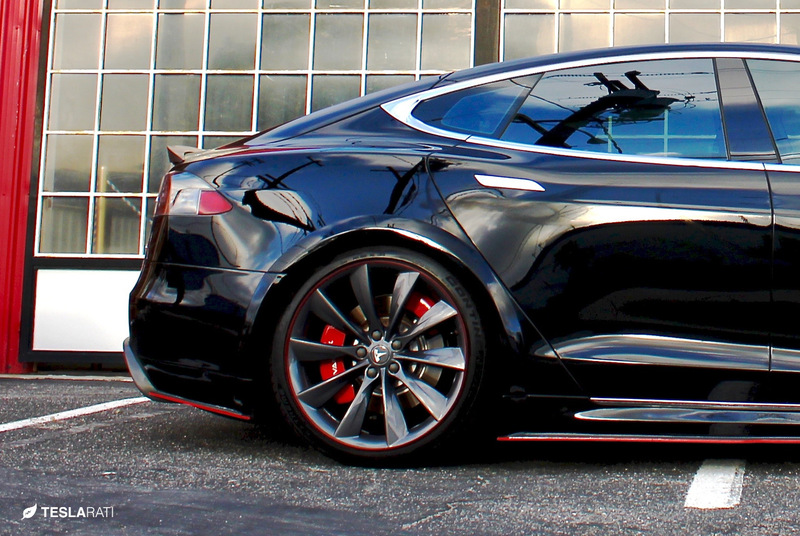 But then again, my Model S doesn’t mind going about business like it’s James Bond in a racing suit.